The Miss Cupcake partnered with Jared Smith created several incredible desserts, and two of them were chosen in this fabulous contest to be finalists. Now, the rest is up to my Facebook friend’s likes and comments. I need you ever so badly! 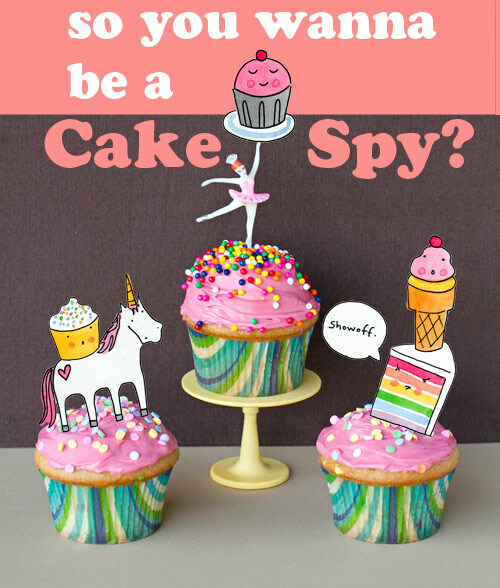 The winner will receive an all expense paid trip to Seattle, Washington to visit Cakespy’s shop and eat cake with her. WOOOO! Spring break in Washington! I know…I know…it’s not Cancun, but Cakespy is my hero! So…keep on reading…and help a sista out!! Finalist 4: Batter Belly Dough Cake by Lauren E.
Batters’ Up! This mile high mini cake is sure to please any batter-licking soul. The hip hugging delight starts with a chocolate chip cookie layer, and then is topped with cookie dough filling. Bring on the brownie with a chocolate fudge variety which is blanketed under a plump layer of brownie batter filling. 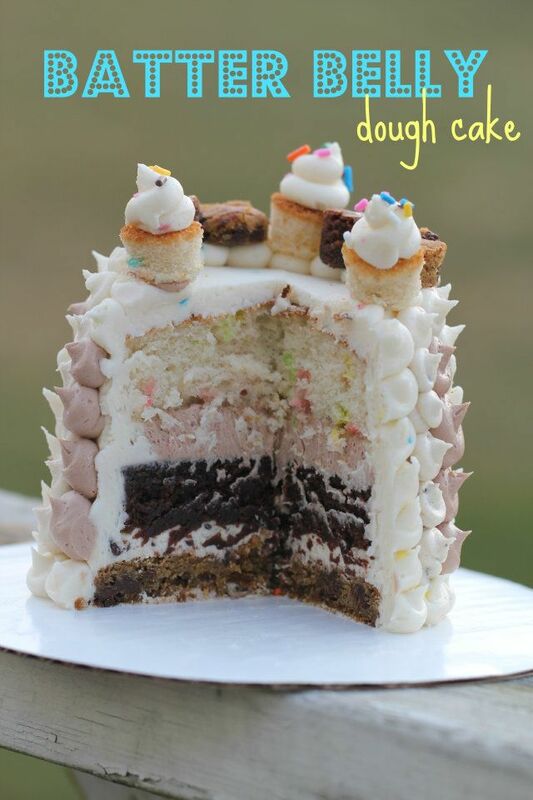 Lastly, a moist funfetti layer sends this cake into doughy harmony. Laced with a cake batter frosting and topped with mini baked treats, this dessert is no dream, it’s an unbaked ecstasy. Dough you want to try it? VOTE FOR ME HERE! The more comments and likes on my photo on CakeSpy’s Facebook page, the bigger chance The Miss Cupcake has of winning! So far, the Batter Belly Dough Cake is in second, about 55 votes behind. GET OVER THERE! VOTE. TELL YOU FRIENDS! If I win, I might just have to share the recipe with you I know you would like that! And then, we were surprised with a SECOND FINALIST ENTRY. 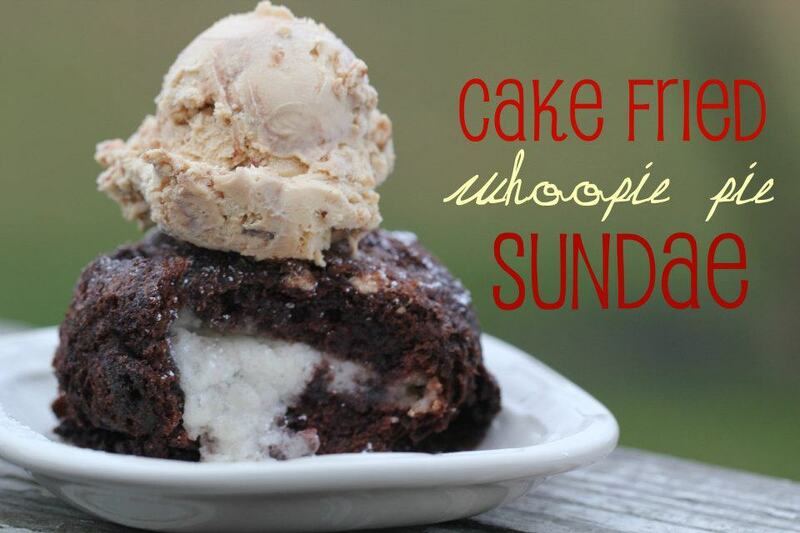 Finalist 6: Cake Fried Whoopie Pie Sundae by Jared S.
Sundays used to be for family, church, and long drives through the countryside (at a slow pace, of course). Then, something happened…the “y” got replaced with an “e”, and sundaes were never the same again. They became something of indulgence and lust. Picture a creamy frozen treat mounted atop a sizzling ball of cake batter fried goodness with a luscious whoopie pie tucked inside all warm and snuggly (like your favorite childhood blanky). This bad boy, weighing in at a hefty 25 pounds, (give or take 24 pounds), will change your life in more ways than imaginable. VOTE FOR THIS ONE HERE! 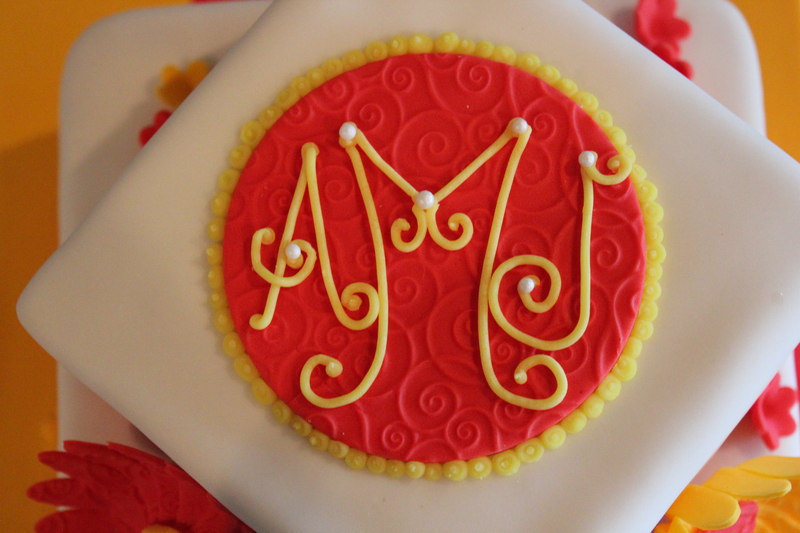 The more comments and likes on my photo on CakeSpy’s Facebook page, the bigger chance The Miss Cupcake has of winning! So far, the Cake Fried Whoopie Pie Sundae is in second.. GET OVER THERE! VOTE. TELL YOU FRIENDS! If I win, I might just have to share the recipe with you I know you would like that!